Both commands have several attributes that control app's behavior (and that are currently configurable only manually, by editing the .ini). 1. Timeout - this controls how long bvckup waits for the command to complete. The default is 1 hour. 2. Critical - when set, it tells the app to abort the backup if the command times out or if it exits with a return code that is different from the one specified. 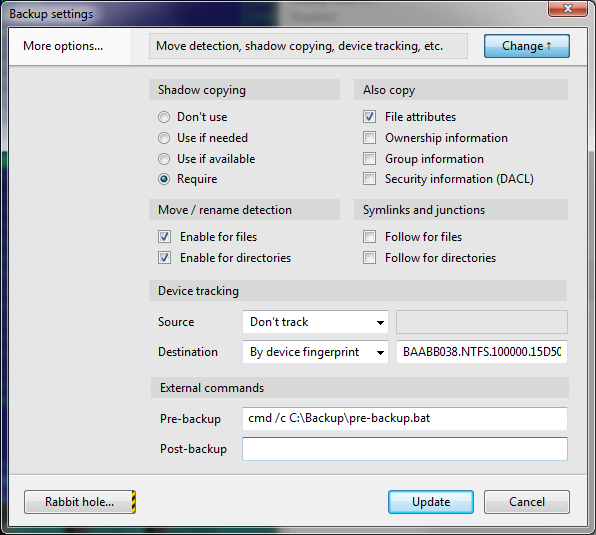 This applies only to the pre-backup command and it is Off by default. 5. Type - this controls if the command is launched by creating a process or via Windows shell. The default is "auto", meaning that the app looks at the command and if it specifies an existing file that ends with ".bat", then it uses the shell method. Otherwise it goes with the process option. Numerically, 1 = process, 2 = shell, 3 = auto. In this case the backup will continue immediately after launching the command and without waiting for it to complete in any form or fashion. In order to pass the specifics of a running backup to the command, the app sets up several environment variables. BVCKUP_state - the state of the backup and it is set to "Initializing" for pre-backup command, and to one of "Cancelled", "Completed", "Failed" for the post-backup command. The "failed" backup run is the one that did not manage to get to the actual backup phase and failed during the preparation (scanning/planning/etc) phase. _written will normally be less than _read if there are delta updates involved. *** As of Release 71 the app sets up various additional variables to the total of about 50-60 that capture some OS details (for example, uptime), the app (version, license, etc) and the backup configuration. *** As of Release 74.21 the set has been further extended to cover pre/post backup commands and details of their execution. A good way to get a feel of how this all works is to set both commands to "cmd /k set". This will simply open a command line window and run "set" command that dumps the environment variables. Type "exit" to close the window and let the backup proceed. 3. Expanded the list of various temporary locations that are excluded by default from the backups. In particular, added locations of IE, Firefox and Chrome caches. 1) I couldn't get them to run at all when in service mode. I'm unsure of whether they were actually being executed. Seems to work ok in non-admin mode. Once my initial backup runs I'll try again in admin mode, but I don't expect any issues. 2) Because the environment is clean and really only includes the ComSpec variable, PowerShell wouldn't execute at all and neither would VMware's vmrun command. I had to wrap my PowerShell script in a batch file and manually set the SystemDrive and SystemRoot environment variables. 3) At some point I tried executing something like "PowerShell &D:\Path\Script.ps1" and the Bvckup log panel interpreted the & like one might do to denote a shortcut key as in the &File menu. Probably no big deal, and might just be a display issue, but I figured I'd point it out just in case. 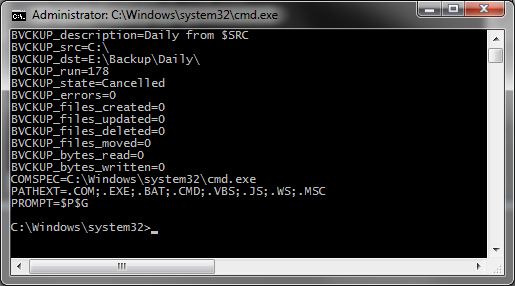 conf.command_pre "cmd /c "d:\folder full of scripts\before-backup.bat""
Could be no big deal, but I thought that might be problematic for escaping quotes. Figured I'd bring it up just in case. Have I mentioned I love the delta copy? Holy moly it's fast! I also really like how the progress bar shows the chunks of the files that are being copied/skipped. Oh, I also have a question. "What to backup" is set to "Everything with some exceptions" by default and also includes a sensible list of exclusions. If "What to backup" is changed to "Start with an empty list", saved, and then set back to "Everything with some exceptions", those sensible exceptions don't come back. Is that deliberate or perhaps a bug? @pgfitzgerald - Very nice feedback, thanks a lot. 2) I can clone the environment of the bvckup's own process. I don't know what I haven't done it actually, so I now changed it to augment bvckup's env rather than to replace it. 3) Good catch, thanks, fixed (in other places too). 4) The .ini entry is OK. It adds enclosing pair of quotes if there's a space in the string. No, not deliberate, just an oversight. Thanks, fixed. BTW, uninstall seems to be broken on a clean install of beta 26. Re: #1 I tried again in service mode. The log says the command ran, but it certainly didn't suspend my virtual machines before it proceeded to back them up. It appears as though the script did run, as it created the temporary file I use to ensure I only start up the VMs I initially suspend. So in my case, it would appear as though the LocalSystem account does not have the ability to programmatically interact with VMware Workstation. Bummer. I'm not usually one to enjoy testing/qa, but I'm having a blast! Maybe it's because projects I've been involved with in the past have had little to no interaction. Feedback from you on feedback from the beta testers is very encouraging. I'll check the uninstall, thanks. Re: "something went wrong" - that crash info is first written into %LocalAppData%\Bvckup2\bvckup2.log and then it tries submitting the same info over HTTP to the server. Can you zip and email me a copy of the log? Or if you'd rather not send the whole log, just the parts that cover the crash points? I got another report of the same kind, so I'd like to identify the cause and fix it asap. Is it possible to trigger another backup job to run as a post backup task ? Nope, not at the moment. Let me see what I can do. Any chance we could get environment variables for start and end times? Would yyyy-mm-dd hh:mm:ss (tz) do? It would probably also make sense to add a var for the total run time, right? Yes, and yes. That would be great. So not to forget - as of R70 there are few more env variables. - start time in “yyyy-mm-dd hh:mm:ss.mmm” format, e.g. "2014-07-19 11:22:33.444"
Default timeout in my ini file is 6:1 which equates to 60 minutes. How does 6:1 become 60? is it 6 with one 0? So for 2 minutes 2:0? I need to change the default, otherwise the 60 minute wait prevents other backups from running - they are queued. See here - https://bvckup2.com/support/forum/topic/513/3036 - but with newer releases you can just use natural notation, e.g. "1 m", "2 h", "3 sec", etc. Thanks Alex, changing timeouts solved the queue problem.